Despite offering state-of-the-art fitness training to your members, you often face the dilemma of dwindling membership rates. While you consistently invest capital to get provide exceptional services, more often than not your members are not enthralled to the extent that they would stick with you for long. With some exciting gym event ideas, you can overcome this problem, and keep your customers coming back to you year round. Following are a few gym event ideas that would make your gym a happening place during all seasons. Gym Event Ideas – Can They Help You? The most precise, factual answer is “Yes.” Carrying out different events at your gyms is a great way to pique your customers’ interest in your gym, leading to a subsequent increase in sales and higher membership rates. Most marketers and business owners regard event marketing as the most effective way to capture your audience’s attention after digital marketing, email campaigns and content marketing. Greater the number of event attendees, greater would be your client conversion. According to multiple researches, nearly 70% of first time visitors turn into a regular customers after attending a gym event. Considering the high success rate these events promise, many business owners are ready to explore their options. Now that you are aware of the effectiveness of events for your fitness club, we can proceed on with different gym event ideas that are guaranteed to bring astounding results. Depending upon the nature of fitness services that you are providing, gym events can be of different types. Your marketing event can be anything from inviting people to try your products to conducting a marathon for fundraising. With the variety that comes with this marketing method, you can be sure to keep your audience hooked up to your gym for long. Let’s look at different ways through which you can get your clients rolling through your door. If you want to revive the motivation in your members, holding a challenge or contest can get your members revved up in no time. A friendly, motivating challenge is a great way to build a sense of community leading to increased memberships. As long as the challenges are fair and offer a reward, it won’t require much effort to get your members involved. Be sure to design various competitions based on the fitness levels and the types of services that you are offering. You can also hold contests based on certain fitness criteria such as most miles covered, maximum weight lost, most calories burnt etc. By carefully analyzing the habits and preferences of your members, you can decide whether a challenge or a contest would capture more attention. Contests come with a prize for the winner and pique the interest of people who are more competitive. A challenge, on the other hand, seems to involve everyone, since anyone who completes is viewed as a winner. While each has its own pros and cons, you can opt for one that your members prefer. Who wouldn’t want to try tasty food, especially when it’s free and healthy? An ideal way to get your members informed about your new product launches is to hold an eating event. No one would say no to a mouth-watering smoothie, some healthy snacks and other menus that guarantee fitness. With members rolling in through your gym door in an eating event, all you need to do is gently push them to share their experience online and spread the word. It’s time to bond with your members beyond the walls of your gym center. Consider inviting your members to a dinner after a rigorous Tabata session or entertain them with a non-alcoholic night out. The idea is to strengthen your social bonds on a personal level so that your members view you more than a mere mentor. This type of bonding type would want your clients to stay with you for long. A welcoming open culture is bound to get your soaring membership rates. To keep your members motivated, you can invite fitness personalities and celebrities to share their experiences with your members. At the end of the session, encourage members to interact with the guest and gain as much insight as they can. A famous fitness personality sharing fitness experience with an audience that looks up to him as a standard figure would be a like a dream come true. 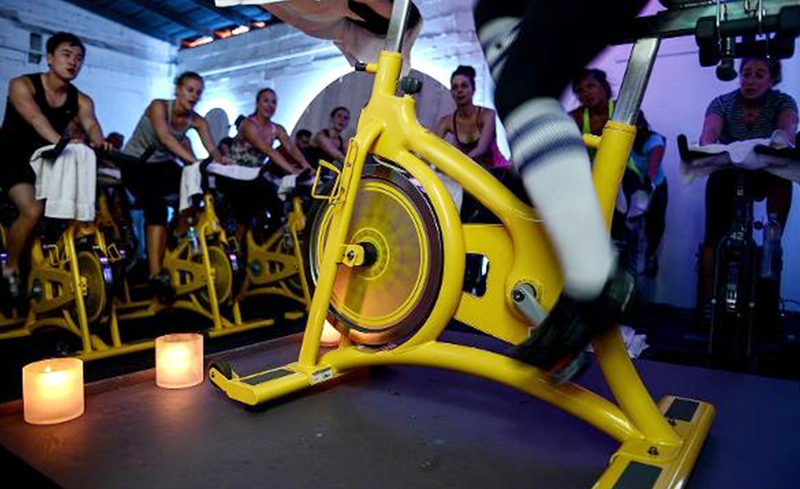 Don’t fret if you are unable to come up with exciting in-house gym event ideas. Have a look around at the events happening near you and rev up your members to take part in them. Events such as Colour Race and Tough Mudder are bound to capture your members’ attention. Tailor specific programs for your gym members or mark your gym’s presence in the form of team by handing them similar T-shirts with your brand’s logo embossed on them. Getting a few marketing stunts done right within your local community is a great way to build trust and retention among your existing clients while reaching out to more people. You can run a seminar on some popular fitness topic or address health conditions that are prevalent in your community. A half an hour session on health family meals or reverse aging workouts can definitely get the local residents interested in your seminar. Make the entry free for everyone and encourage your visitors to bring along friends and family. Another way to keep your members coming back to your gym for more is to run specialist courses for a period of 4-6 weeks providing information along with training for a specific niche. Topics that would gain you most traction include pre and post-natal fitness, weight loss and age-specific workouts. By education your clients both in theory and practical, you can re-assert your brand as an expert in the industry. Workshops come with a lot of convenience for the members. Since these type of sessions don’t require a lot of time, they can provide your customers with the right training or information within two or three days. Their practical nature enables members to quickly grasp the concept, bringing it to practice. You can charge a small fee from your members or provide them with free guidance to capture leads. Make it a point that your existing clients are offered special seating as a perk for staying committed to you. Launch events are the right marketing technique that you need to create the much-desired hype. Whether you are looking to introduce a brand new product or opening a new branch for your fitness club, launch events can get your brand the attention that it requires. You can invite some journalists to try the fitness classes or visit the new gym to get coverage in newspapers and magazines. Promote the event on social media and voila! You have a recipe for returning customers. Pitch in several gym event ideas and dedicate a single day offering your members workshops, eating festivals and free training sessions, making them feel valued and cared for. This free sampling would bring in reciprocity from your members, tying them happily with your brand. Have you considered stepping into your corporate social responsibility realm? If no is the answer, then now is the time to give away to get more. Look around yourself and pick up a cause that suits your brand values and defines your goal in the industry. Then hold a charity event to raise money for the fitness-related cause, while highlighting your brand building up a positive, soft image in front of your audience. A charity event would get your brand media coverage, your members will feel motivated and good about their fitness efforts all the while raising money for a legitimate cause. Wellness tourism is the new thing that has taken over fitness as well as tourism industry. The sector is bringing in 50% more revenue than any other form of tourism. Arranging healthy retreats for your members for weekends is a good way to add another income stream to your business. It would also make your members feel connected to your brand on a personal level, leading to loyalty. By joining hands with other local businesses, you can easily run large-scale events. This way you will not be able to reach out to a wider audience but also connect to your partner’s target audience. While this might be true for your partner too, opt partnering with a business that would complement your product and services without being in direct competition with your brand. You can form partnerships with massage centers, physiotherapists, healthy food outlets etc. Look for freelancing trainers with proper certifications and invite them to give training in your gym. You can charge them a small fee for using your space, while your members get specialized training. Make sure that your staff gets to train too by reserving free space for them or offering them a discount. If you don’t find the space to hold in-house events, carry an online competition or a webinar. Participating in digital events organized by other businesses is also a good way to get your brand familiarized across different audiences. With the different gym event ideas for you to consider, there might be one that will actually tick for you. Now lies the task to put all pieces together and execute the idea. Following are some important tips that you should be heedful towards to get maximum results from your event. Your goal should be well defined – Why are you conducting a particular event and what do you plan to get out of it? Do your homework – Prepare everything beforehand. Jot down minutest details so that you don’t miss out on anything important during the event. Add free samples - Give away free samples with logo of your brand embedded on the items. You can give away t-shirts, stationary and water bottles for the attendees. Ensure attendance – You don’t want to host an event with missing audience. Plan pre-sales to ensure an encouraging turnaround. Gather feedback – Feedback would help you analyze the success factor of the event and help you identify loopholes which you can avoid in your next event. By picking any of these gym event ideas, you can reach out to a wider audience, get more brand awareness, and improve customer retention and revenue for your business. Since healthy events play an important part in community awareness, they are ideal for strengthening bonds and improving loyalty and retention among members. Regardless of which idea you choose, make it a point thoroughly to conduct your research to maximize the results. Do you have an interesting gym event idea that has worked remarkably well for your gym? If yes, share it us here.